COMPEX SYSTEMS, A SUBSIDIARI OF POWERMATIC DATA SYSTEMS IN SINGAPORE IS A GLOBAL OEM LEADER IN WIRELESS COMMUNICATIONS. 524WiFi (PFCOM Tomorrow communication systems holding) is COMPEX authorised EU and Worldvide distributor and service partner since 2003. We offer complete pre and post sales services as well as technical support and OEM customization services. We offer specialised networking solutions for best WiFi Data Rates, complete optical networks solution, and Data over Coax cable. Specialised for outdoor long range WiFi and heavy indoor and outdoor WiFi for passangers or transport applications, optical lines and Ethernet Over Coax coverage with best data rates. According to different scenarios, Wodaplug can provide various of access products, including HFC optical receiver module, ONU module, optical fiber transceiver module and EOC master module. EOC solution is the best choice for operators to build the coaxial network. All EOC products were independent researched and development by Wodasign corp, they have the complete intellectual property. Include the fusion of passive optical network, Ethernet, simulate a variety of optical transmission technology, network security and network management, which can meet the operators requirements to provide users with a highly reliable network service. We are specialists in providing heavy load , robust and OEM services for wireless solutions. Compex provides total wireless solutions ranging from wireless modules to embedded boards. We cater to customers who want fast-to-market solutions based on Qualcomm Atheros (QCA) designs. Design and develop operating systems, network management systems and proprietary wireless drivers to power our hardware. With Strong partnership with Qualcomm Atheros (QCA), we are officially appointed as their Authorized Design Centre. Qualcomm Atheros is a wholly owned subsidiary of Qualcomm Technologies, Inc. and is a leading provider of wireless and wired technologies for the mobile, networking, computing and consumer electronics markets. Qualcomm Atheros established the Authorized Design Centre (ADC) program to support novel applications for its wireless technology. Authorized Design Centre have expertise spanning RF design and RTOS and QCA products’ driver development. Compex is the only Authorized Design Centre appointed and Endorsed by Qualcomm Atheros in the South East Asia region. 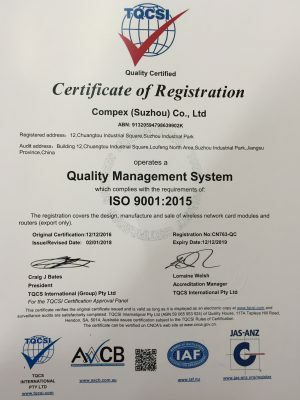 Compex solely owned manufacturing facilities is located Suzhou China, has a state of the art shop floor management system designed to increase efficiency and improve quality assurance of the entire manufacturing process. Our manufacturing facilities is ISO9001:2015 certified. Our advanced manufacturing processes enable us to improve manufacturing time and at the same time, ensuring that manufacturing capacity is at this top performance. Compex implements a consistent high-quality testing and thorough calibration process to each and every products manufactured, ensure that every products shipping out to our customers meet our strict quality control standards. Information related to revision of products, changes in Bill of Materials (BOM) for products, and process changes due to revision of products or new products introduction are updated towards the production via our advanced system. Automated shop floor equipment control and data collection is regulated to reduce human errors and maximize productivity. Our SMT line using Nitrogen for the reflow process that can provide a consistently high quality solder for all our products. Advanced SMT Inspection equipment feature high speed Solder Paste Inspection system to monitor and control quality of our soldering, automated X-Ray machine on the SMT line evaluating solder joint integrity effectively and Automated Optical Inspection system to inspect for a comprehensive list of component and solder joint defects. Each and every products manufactured, are individually calibrated and testing, to ensure a high quality products are produced for our customers. For every wireless embedded boards and embedded modules produced, they are individually tested by IQxel and IQview to ensure their wireless calibration are up to our strict standards, while our antennas produced, are individually tested with a Network Analyzer (Agilent) to ensure each antenna isolation meet our strict standard. WODAPLUG ® = NO NEW WIRES / USE EXISTING CABLES ! © 2019 - Tomorrow Systems. s r.o.